Last week I tried this meatless burger in a bowl recipe and oh my goodness, it is so so good!!! Basically, it’s a burger without a bun in a bowl. Its jam packed full of veggies to stay nutritious for you and your family, and with the burger sauce and pickles, it fulfills those comfort food cravings while still staying nice and light. Perfect for those hot summer days! Use my ingredients list as a guide for any burger toppings of your choice, but make sure to add those pickles! They make it so so tasty! The yams also make the burger in a bowl a bit more filling and help add some more flavour. 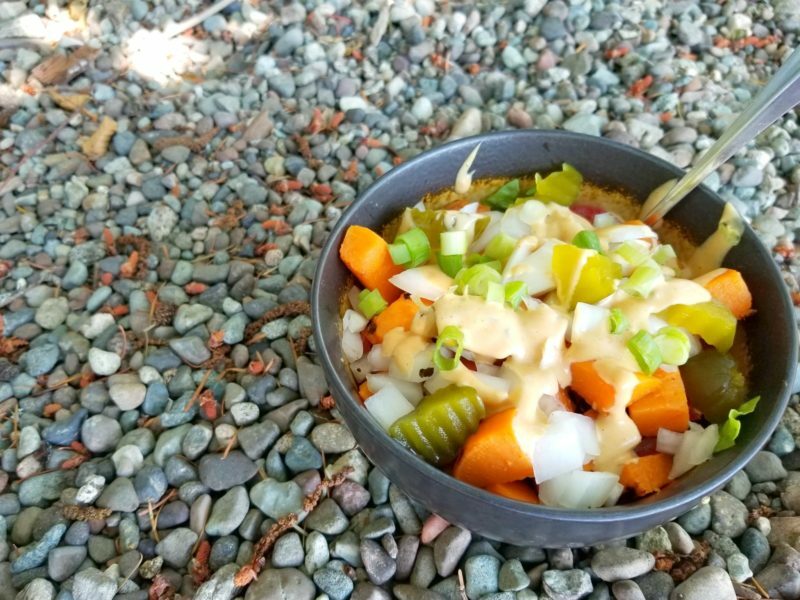 The burger sauce was created by throwing a few random things together and it turned out quite good, but there are also lots of different burger sauces you can try on Pinterest to customize your bowl even more. If you give this tasty recipe a try make sure to tag @HappyStylishFit and use the hashtag #HSFLife for a chance to be featured and so I can see your tasty creations! Burgers are great in all their glory, but sometimes it's nice to have a lighter version. This meatless burger bowl is perfect for a lazy cooking night when you just want to throw a few things together and it tastes so so good! 1/2 cup Pickles, straight outta the jar or diced or more pickles, if you really like pickles like me! Fry Gardein Meatless Ground according to directions and add red pepper flakes, salt & pepper. Once cooked place to the side and wipe the pan out to use again. Pour water and yams into frying pan. Cook covered on medium-high until tender, adding water and stirring as necessary. While cooking prepare burger sauce. Once tender pour out any remaining water and quickly fry with chili powder, salt, and pepper to add some extra flavour. Stir together mayo, ketchup, mustard, bbq sauce, pickle brine, chili powder, salt, and pepper. Stack lettuce, spinach, tomato, onion, burger "meat", yams, and pickles in 2 bowls. Top with burger sauce and sesame seeds. Wow this is so different! Sounds so yummy! Oh my! That looks really good! And it’s so easy to make too! I would have never thought to put it in a bowl! Genius!